“My name is Muhammad Ali. I am a Pathan, born in Quetta, and living in Karachi since the last decade. I am sixteen years old, can speak and read Urdu well besides Pashtu. My parents had migrated from Afghanistan. I don’t know exactly when they migrated, which area they belonged to in Afghanistan or why they had to migrate.” The respondent was interviewed for a research study in Karachi by the Collective team. It is an unambiguous fact that people like young Muhammad Ali are not conflict refugees or ‘migrants’ but he can be easily perceived as a security threat in Pakistan. Afghanistan and Pakistan are two neighbouring states with a porous border and a long and varied history of cross-border migrations. While the porous border facilitates migration, it is the economic, political and security situation, both in Afghanistan and Pakistan, which has encouraged cross-border migration, hosting of refugees and exchange of militants between the two countries with the support of state and non-state functionaries. Ali is living in Karachi with the status of a refugee-migrant, as do thousands of his peers. He is a trained helper in mechanical work but due to some ailment, had to quit physically intensive work and now works as a garbage picker instead. Legal citizenship status in Pakistan can be seen in light of the Pakistan Citizenship Act 1951 which states that “Every person born in Pakistan after the commencement of this Act shall be a citizen of Pakistan by birth.” Thereafter, a major shift occurred when the National Assembly and the Senate were suspended in a military coup under the Provisional Constitution Order No. 1 of 1999, and a new ordinance called National Database and Registration Authority (NADRA) Ordinance, 2000 was promulgated. NADRA was authorized to issue Computerized National Identity Cards (CNICs) to citizens of Pakistan and to register foreigners and non-citizens simultaneously. After the 9/11 attacks and the ensuing war in Afghanistan, however, the military government in Pakistan introduced the National Aliens’ Registration Authority (NARA) by resorting to a colonial law - the Foreigners Act of 1946 – that preceded the Citizenship Act of 1951. The core objective of establishing NARA was to offer legal cover to “illegal aliens” to live and work in Pakistan. Soon after, however, Pakistan changed its policy to not regularize Afghan refugees and the domain of NARA was restricted to only Bengalis and Burmese living in Karachi. This shift in policy to not regularize Afghan refugees resulted in the establishment of a special organization, called the Afghan Refugee Repatriation Cell (ARRC) in early 2000s for the registration and voluntary repatriation of Afghans. ARRC’s Proof of Registration (PoR) cards were valid up to 2012. In mid-2013, the federal government extended the PoR Cards for those Afghans who have been living in Pakistan for three decades or more. However, since December 2015, the PoR cards have not being renewed. This has effectively rendered all Afghan refugees settled in Pakistan for the past 3 decades as illegal migrants. “How can I negotiate for my well-being with the government? I am a garbage picker like thousands of other Pathans. I am no more an Afghan; I speak Urdu. I don’t know about my parents’ native village but the Pakistan government is determined to expatriate me and is not willing to accept me as a Pakistani national." Solid waste management is acknowledged as a public good and as such, in most developed and developing countries, governments are responsible for provision of these services. In Pakistan, however, only 25.7 per cent waste is managed by the state. 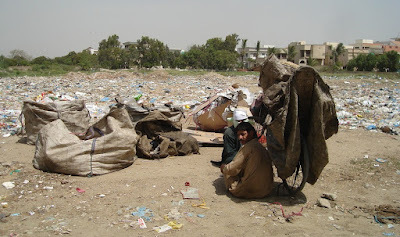 The rest is done by informal systems and private arrangements There are several approved and unapproved waste dumping sites in Karachi where Afghan youth collect garbage, sort it accordingly and get daily wages from local contractors. In Karachi garbage picking and sorting for further re-use and for the re-cycling industry is overwhelmingly dominated by Afghan youth. “The government wants us to go back without knowing our issues and is aiming for forced eviction. But why?” added Ali. This is an important question. Other issues that need to be discerned before sending people back are: how and when did these ‘illegal aliens’ - Bengali, Burmese and Afghans - come and settle in Karachi? How have they sustained themselves economically? And more importantly, what is their contribution to the local economy and how will the local economy fill the void created if they are repatriated? Before the securitization of migration and repatriation of Pakistan born youth, the state should internalize above questions and also consider the grievances of the second generation Afghans being labeled as ‘illegal aliens’ or ‘refugees’. While it is understandable that provision of public resources – such as housing, education and health facilities is an onerous task for the Pakistani state, there needs to be clarity on the status of these ‘aliens’, especially since they are not living in refugee camps and performing essential economic functions for the country. Afghan refugees are playing an essential role in Pakistan. They should be incorporated into a formal system and compensated for appropriately. They are the future of materials and a sustainable planet.